Connect your Zoom account to your marketing platform. 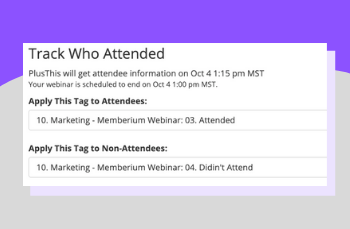 Register guests, send reminders, segment attendees and non-attendees and more. Connect PlusThis with Zoom. You'll find your upcoming webinars listed in PlusThis. Select the webinar you want to sync. 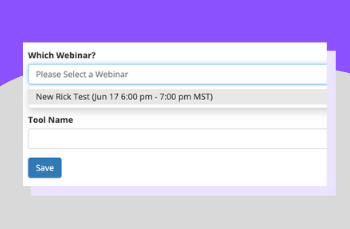 PlusThis has a number of settings you can configure for automating more parts of your webinar campaign. Store your join links, apply tags on attendees, apply tags based on surveys and polls. PlusThis will tell you where to apply our tool in your campaign. You can then focus on running your webinar while PlusThis handles the heavy lifting behind the curtains. Fantastic tool suite! If you want to maximize your Infusionsoft App, you need to add PlusThis to your tech stack. From the basics of Smart Links through the very useful GoToWebinar and Zoom features. I love the video triggers to monitor the behavior of people watching my client's videos so I can trigger follow-up sequences based on what they have, or have not watched. "Plus" that up and turn your webinar into an evergreen funnel. The team over a PlusThis is fantastic and their webinars are a wonderful inspiration for new ways to enhance the customer journey. If you have Infusionsoft, you have to have PlusThis.